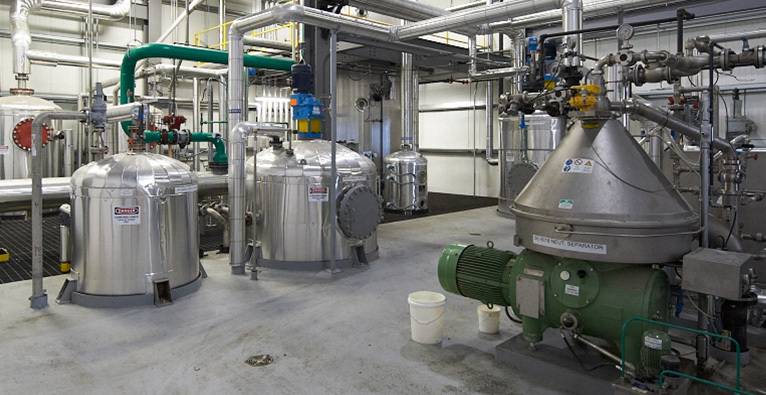 Crown’s MultiPure Degumming/Neutralizing system provides flexibility when degumming oil for storage, sale or physical refining or to neutralize oil in chemical refining. Residual soap in the neutralized oil may be reduced by either water-washing the oil or by using special sorbents and filtration, and temperature and retention times can be adjusted as the oil or its quality changes. Crown’s neutralizing processes include two-stage neutralizing, which is neutralizing followed by water-washing or reaction with special sorbents; or three-stage neutralizing, which is when water-washing or reaction with special sorbents follows two neutralizations, or when a single neutralization is followed by two purification steps using either water-washing, reaction with special sorbents or a combination of the two. A third process, cold neutralizing, is used on specific oils and combines neutralizing and winterizing or dewaxing into a single process.